Rediscover Panama City Beach. The new developments and changing landscape of this coastal community have re-defined its image of a springbreak mecca of college students. With new upscale shopping centers like Pier Park; Panama City Beach emerges as a wonderful and desirable destination for families, couples, sporting events, business travelers, golfers, and more. Edgewater Beach and Golf Resort, The only full service resort on Panama City Beach, Florida. Our non-smoking, first floor, ocean front, corner unit in Tower 2 is available to you! It features three bedroom SUITES with a 525 sq. ft. private wrap-around balcony. Enjoy panoramic views of the emerald Gulf plus all the action on the beach. Unit is only approx. 15 stairs to the beach, pools, jacuzzi's and much more. Our family vacation home is as close to the beach and water as you can get. Not kidding! Inside... YOU can expect the UNEXPECTED! Our 1847 square-foot deluxe unit is the largest and most luxurious suite style at Edgewater Beach and Golf Resort. LAVISHLY DECORATED, using a West Indies, tropical theme - you can imagine being in ISLAND PARADISE! As soon as you enter the foyer, you'll realize that this unique vacation destination is going to be one to remember. The private balcony opens from the dining room, kitchen, living room, master bedroom suite and 1st guest bedroom suite. The balcony faces both south and east so you can sun worship, while other members of your party retreats to the shade. The 525-square-foot wrap-around balcony, the largest at Edgewater also provides a nice cross-breeze to make even the hottest day tolerable. The balcony is furnished with comfortable chairs for outdoor dining, relaxing with a good book, or just enjoying one of our spectacular sunsets over the emerald-green water and shimmering, crystal white sand of the Gulf beaches. * 24/7 Gated Security and security guard walk through throughout entire resort. * We will not accept rentals for those under the age of 26. Age verification is required. * Weekly Sat to Sat rentals during Springbreak, Summer, and late Summer seasons only. * Check-in is 3:00 p.m. C.T., Check-out is 10 a.m. Central Time. Failure to abide results in a $150 charge. Why? Cleaning takes time...I want an clean unit for you and the next renter! * $300 Security/Damage deposit required and refunded after satisfactory inspection of unit, return of all keys and property armbands. * The average water temperature is in the high 70's and the average air temperature is high 70's*. Therefore, it is extremely pleasant for you all year round. EXTRAS PROVIDED To YOU: clothes and dishwasher detergents, fabric softener, some cleaning supplies, Egyptian cotton bed linens and high quality bath towels. Please bring your own beach towels. Stay with us and see a difference! Location, Location, Location... Edgewater is a fabulous, family-friendly gated with 24 hour patrol vacation spot. First floor, corner end 3 bedroom condo, 3 bath (3 suites) in Tower 2. An amazing panoramic beach view! 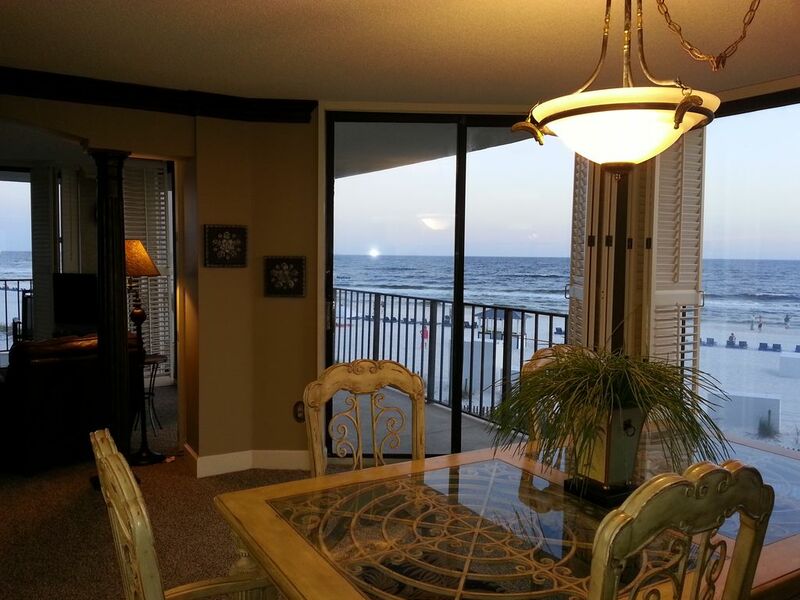 Directly on the Beach- First floor, 3 BDR, End unit with Wrap Around Balcony -the Gulf of Mexico, Florida. One set of linens for our king, queen and 2 double beds. Large capacity washer located in our unit. Large capacity dryer located in our condo. Edgewater Beach & Golf Resort is a 24 hour patrolled gated community. EBR requires each vehicle to obtain a $10.00 property entry pass which will be added to rental rate. At Edgewater's gym at your added expense. Unit is located at Tower 2, First floor, corner unit which for most an elevator is not needed. Overlooking the fabulous 'Gulf of Mexico'... a diner's dream! TV is connected to premium cable. Our first floor unit has a private wrap around balcony. Access from the master suite, the second master suite, living room and dining room. Always a great sunset and sunrise. 3 pools plus 11,500 sq. ft. Lagoon Pool. Featuring rock formations and water falls! 2 Heated pools. Our condo is lavishly decorated and fully furnished with all your needs. Extras include: wall-to-wall Karastan carpeting in the bedrooms and the living areas, wood floors in the hallway and ceramic tile in the kitchen and bathrooms. The fully equipped kitchen has Corian countertops. Throughout the unit, you'll be surrounded by custom trim molding and custom designed pillars. For your added comfort: reading chairs, sofa, ottomans, and reading lap. This condo rental DOES NOT include beach chairs and umbrella set up. So... 'Indulge Yourself'; You deserve it, Without guilt! We loved our stay in this unit, the deck was so relaxing with beautiful panoramic views. It is so perfectly located (just steps away from the beach access as well as the main pool and restaurant). Edgewater has always been one of my favorite resorts and it still is! We will definitely check with Liz 1st for any future trips when we need this much space! Enjoyed staying at Liz's place perfect spot right beside the restaurant and pools on both sides, came for a girls weekend and had a great time even though IRMA was brewing! Loved the ocean view. Easy access in and out. The balcony is spacious. Enjoyed the stay!!! Great piece of property!! Will stay again!! Thank you for taking the time to rate your experience! Come back real soon and enjoy the 10% repeat customer discount (not applicable during Jan and Feb)! Full Resort. Dine inside or out at Ocean's Bar & Grill. Ocean's provides private gulf front dining with live seasonal music a large tiki bar and unique delicious dishes to please all ages and every palate. Enjoy Pizza and snacks from Paradise Pizza, Starbucks Coffee from Edgie's Corner Market and fabulous, delicious frozen cocktails from Blender's. These casual restaurants are open for breakfast, lunch, and dinner along with a full service bar. Resort offers Edgie's Corner Market, an Arcade, Hair and Nail Salon onsight. If you are in the mood for a casual fine dining experience...just walk across the street to Firefly Restaurant. Access to many water sports, shuffleboard courts, 6 tennis courts, 36 holes of Golf, Fitness Center, Spa Services and the Kid's Adventure Zone at an additional cost. The Adventure Zone includes Splash Pad and Sky Trail Rope Course. The Adventure Zone is opened late May through early August. Edgewater offers Kid's Day Out and Kid's Night Out. All activities require appointments or reservations and can be purchased separately through Edgewater's Activities Club. Edgewater is 4 miles to the growing Pier Park Retail, Dining and Entertainment Center, a short distance to Hombre, Bay Point, Holiday and 30 MINUTES TO the GOLF MECCA OF DESTIN. Experience antiques, galleries, Silver Sands outlet malls, Destin Commons and flea markets. Happiness is...vacationing at Edgewater.